Working as a Respiratory Therapist, you’re definitely going to have to deal with your fair share of mucus. It’s just a part of the job. This is why it’s so important to learn all about the mucus-controlling drugs and how to use them properly to helps patients who have a lot of mucus. 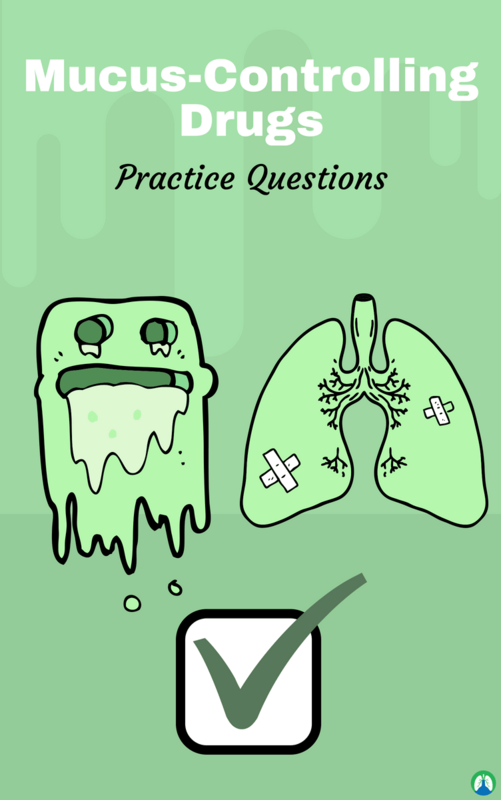 So to help you with that, we put together this study guide that is loaded with practice questions that can teach you everything you need to know about the mucus-controlling drugs used in Respiratory Therapy. Are you ready to get started? 1. What is a mucolytic? It is a medicine that degrades polymers in secretions, mucin, and peptides. It also breaks the pathologic filaments of the DNS or actin in sputum. Basically, mucolytics are drugs that we give to help break up mucus. 2. What is the mucolytic action? They help with the thinning of secretions. 3. What are mucoregulatory drugs? They are drugs that reduce the volume of airway mucus secretion and appear to be especially effective in hypersecretory states, such as bronchorrhea, diffuse panbronchiolitis (DPB) and some asthma. 4. What does mucoactive mean? A term connoting any medication or drug that has an effect on mucus secretions and may include mucolytic expectorant, mucospissic, mucoregulatory, or mucokinetic agents. 5. What is a mucokinetic? A medication that increases ciliary clearance of respiratory mucus secretions. 6. What are the clinical indications for the use of mucoactive therapy? Reduce accumulation of airway secretions, improving pulmonary function and gas exchange and preventing repeated infection and airway damage. Also known as mucomyst, it is used with the treatment of conditions associated with viscous secretions. Its hazards include bronchospasm and mechanical obstruction of airway. Any time mucomyst is administered, a bronchodilator should be given as well. 8. What is dornase alfa? It is the brand name of pulmozyme and is given via SVN 2.5 mg/ampule; one ampule daily. It is used in cystic fibrosis patients only. It is used in cystic fibrosis patients and works on the DNA of mucus. It is used to improve or preserve pulmonary function in these patients. 9. What is hyperosmolar 7% saline? Brand name: hyper sal; svn: 4 ml; and, use airway clearance (mucokinetics) for therapy of cystic fibrosis (7% saline and mannitol). 10. What is dry powder mannitol? Brand name: bronchitol and it is used for airway clearance (mucokinetics) for therapy of cystic fibrosis (7% saline and mannitol). 11. What is 3% hyperosmolar saline used for? It is used for infantile bronchiolitis. 12. What two phases of mucus form the secretions that line the surface of the airway? The gel layer is propelled toward the larynx by the cilia and lies atop. A weak gel periciliary layer is about the height of a fully extended cilium. The cells responsible for secretions in the airway are the surface epithelial cells and the submucosal glands. It is secretions from the surface of the goblet cells and submucosal glands composed of water, proteins, and glycosylated mucins. The glycoprotein portion of the secretion is termed mucin. Mucus is the secretion and mucous is the cell or gland type. Purulent material in the airway. Expectorated secretions that are contained in the respiratory tract. It is composed of oropharyngeal and nasopharyngeal secretions; bacteria; and, products of inflammation including polymeric DNA and actin. 16. What are the factors that affect mucociliary transport? COPD, airway drying, narcotics, endotracheal suctioning, airway trauma and trach, tobacco smoke and tobacco smoke extract, atmospheric pollutants and allergies may increase transport especially at low concentrations but higher, toxic concentrations or with prolonged exposure. 17. What is secretory hyperresponsiveness? It is increased mucus secretion either intrinsically or in response to Bronchoprovocation. 18. What is the indication for expectorant drugs? To remove mucus from both lungs and airway passages during coughing. 19. What are the physical properties of mucus? Viscosity, elasticity, cohesivity and adhesivity. 20. Where is mucus located? 21. Where is phlegm located? 22. Where is sputum located? Outside the body (when you can see it). 23. What is mucus designed for? To trap bacteria and viruses before they get further into the airways. 24. What is the mucociliary escalator? It serves as a major defense system. 25. What can the failure of the mucociliary escalator cause? 26. What are the properties of mucus? Mucus is protective, lubricating, waterproofing, and helps to entrap microorganisms. 27. What are the indications for mucus controlling drugs? To reduce accumulation of airway secretions, improve pulmonary function and gas exchange, and prevent repeated infection and airway damage. 28. What diseases sepcifically need mucus-controlling drugs? Cystic fibrosis, chronic bronchitis, pneumonia, asthma, and bronchiectasis. 29. Where there is a bronchi irritation, there is also what? Usually an increase in mucus secretions. 30. What type of drug is NAC incompatible with? Inhaled antibiotics but can be given at different times. 31. What is the dornase alfa mode of action? When given via aerosol, it reduces the viscosity and adhesivity by breaking down the DNA in mucus. 32. How can dornase alfa be preserved? It should be refrigerated and protected from light. 33. What is an expectorant? Mediations that are meant to increase the volume or hydration of airway secretions. 34. What are some examples of expectorant drugs? Guaifenesin, robatusson (not very effective) and can be ciliotoxic when applied directly to respiratory epithelium. 35. What is the cilia function? It keeps moving things forward. 36. What are mucoactive agents? Drugs that cause any type of change in the actual structure of mucus. 37. What are mucokinetic agents? They help with the movement of mucus. 38. What are mucoregulatory agents? They help with mucus regulation. 39. What are mucospissic agents? They want to make mucus thicker. 40. What are mucolytic agents? They breakdown the bonds in mucus. 41. What are the factors that slow the mucociliary transport rate? COPD, cystic fibrosis, airway drying, narcotics and endotracheal suctioning. 42. How much mucus does a healthy person secrete per day? The ability to return to the normal shape. 45. What are the types of mucoactive agents? 46. What is the function of mucolytics? They serve to decrease the elasticity and viscosity of mucus because the gel structure is broken down. 47. What is the function of mucokinetic drugs? Increases cough clearance by increasing expiratory airflow or by reducing sputum adhesivity and tenacity. Bronchodilators but increases mucus production. 48. What are the two layers of the mucosal blanket? Gel (top) and sol (bottom). 49. What is the composition of mucus molecules? 95% water and 5% polypeptide chains. 50. What are some diseases that increase the volume or thickness of mucus? Chronic bronchitis, asthma, cystic fibrosis, acute bronchitis, and pneumonia. 51. What factors impair ciliary activity? Endotracheal tubes, extreme temperatures, high oxygen concentrations, dust, fumes, smoke, dehydration, thick mucus, and infection. 52. What are the three pharmacological approaches to secretion management? Increase the depth of the sol layer (water, expectorants, saline), alter the consistency of the gel layer (mucolytics) and improve ciliary activity (corticosteroids and bronchodilators). 53. What is the function of the mucosal blanket? Covers the airway and traps inhaled bacteria and particles. 54. What is the mechanism of action for bland aerosols? Does not affect mucus directly, but alters the water content. 55. What are the three delivery methods for bland aerosols? Humidifiers, aerosols, and direct instillation. 56. What is the mechanism of action for mucolytics? Controls mucus by directly altering the structure of the mucus molecule. 57. What factors can lead to dehydration and thick mucus? Increased respiratory rate, increased depth of breathing, systemic fluid loss and infections. 58. What is another term for bland aerosols? 59. What does isotonic mean? Same chemical makeup as the bodily fluids. 60. What is the difference between sterile and distilled water? Sterile: has additives and distilled: have no additives, considered pure. 61. When is normal saline used? As a solvent to make water isotonic to the body. 62. What are the two mucolytic drugs? Acetylcysteine (mucomyst, mucosol) and dornase alfa (pulmozyme). 63. What is the description of the three layers of the airway? Mucosal blanket: contains serous and goblet cells, gel and sol layers; submucosal: contains bronchial glands which produce mucus; and, adventitia: keeps the structure of the airway, composed of connective tissue, can expand and contract. 64. Roughly how much mucus does the body produce daily? 65. What is the function of the gel layer of the mucosal blanket? It is sticky and gelatinous and it catches the particles and bacteria. 66. What is the function of the sol layer of the mucosal blanket? It is watery and allows cilia to beat freely. 67. What is the description of water? Can be sterile or distilled, bland aerosol and cool mist (soothing effect). 68. What is the description normal saline? Bland aerosol, 0.9% sodium chloride, used as a solvent for other medications and isotonic to bodily fluids. 69. What is the description hypotonic saline? Bland aerosol, 0.45% sodium chloride (half normal saline) and less irritating to the airways. 70. What is the description hypertonic saline? Bland aerosol, greater than 0.9% sodium chloride (5% and 10%), must pretreat the airway with a SABA bronchodilator prior to administration (very irritating) and stimulates cough and thins mucus. 71. What are humidifiers used for? Mainly oxygen delivery and decreases the drying effects of oxygen by delivering water vapor. Administration method of bland aerosols and produce small water particles. 73. What is direct instillation? Directly administering the drug to the airways using an endotracheal tube (most common). 74. What is acetylcysteine’s mechanism of action and trade names? Disrupts the disulfide bonds, reduces the viscosity and elasticity of mucus; and, mucomyst or mucosol. 75. What are the dosages of acetylcysteine? 10% solution: 3-5 ml TID-QID; 20% solution: 6-10 ml TID-QID and instillation: 1-2 ml at either strength. 76. What are the adverse reactions of acetylcysteine? Bronchospasm (pretreat with bronchodilator), nausea, rhinorrhea, mucus plugging and used as an antidote for tylenol overdose. 77. What is dornase alfa’s trade name and mechanism of action? Pulmozyme and breaks down the DNA material of the mucus membrane, reducing the viscosity and restoring its ability to flow. 78. What is the dosage of dornase alfa? 2.5 mg and one time a day. 79. Dornase alfa is primarily used to treat what? 80. What is the mechanism of action for expectorants? Increases the production and expectoration of mucus by increasing the amount of fluid in the respiratory tract and stimulating cough. 81. What is another word for expectorant? 82. What is the mechanism of action for antitussives/cough suppressants? Depress the cough center in the medulla. 83. What are the expectorant drugs? 84. What are the antitussive/cough suppressants drugs? 85. What layer(s) make up the mucosal blanket that covers the airways? 86. What are bland aerosols? 87. A patient with a dry, nonproductive cough who requires a sputum induction for tuberculosis testing may benefit from what solution? 88. What should be noted on the drug dornase alfa? It is indicated for maintenance therapy for secretions in cystic fibrosis patients, should not be mixed with other medications and should be refrigerated and protected from light. 89. What are the four functions of mucus in maintaining a healthy pulmonary system? Preventing water from moving in and out of epithelia, shielding epithelia from direct contact with toxic materials, irritants, and microorganisms, preventing infection and lubricating the airway. 90. What would be best to prevent a bronchospasm in a patient who is ordered nebulized acetylcysteine? Pretreat the patient with 2.5 mg of albuterol by nebulizer 20 min prior to the mucomyst. 91. What may be recommended when secretions are thick and tenacious and cannot be easily removed. 92. What is another word for tenacious? 93. What are two examples of mucolytic medications? Acetylcysteine and Recombinant human DNAse. 94. What is another name for the medication acetylcysteine? 95. What is another name for the medication Recombinant human DNAse? 96. What are two indications for the use of mucomyst? To liquefy thick tenacious secretions and to treat acetaminophen overdose. 97. What is the most common side effect of mucomyst? 98. When should patients taking acetylcysteine be given a bronchodilator? 99. Pulmozyme is indicated specifically for patients who have what disease process? 100. What are six side effects of pulmozyme? So there you have it. I hope these practice questions were helpful for you. If you use this study guide properly, you will definitely learn everything you need to know about mucus-controlling drugs and more. Thank you so much for reading and as always, breathe easy my friend.